On Tuesday night, teams came together one last time to deconstruct and distribute their cans to their final destination – the Greater Chicago Food Depository. 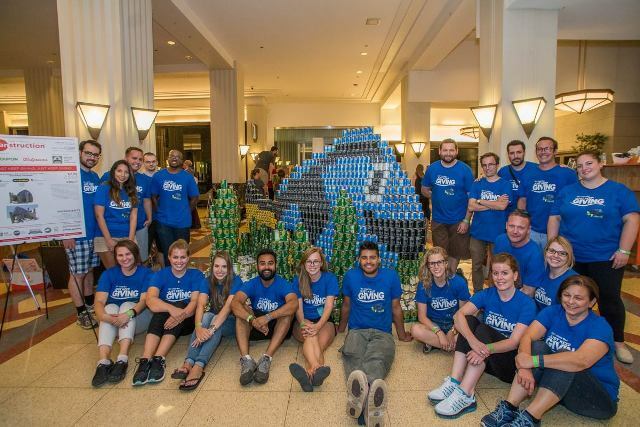 For those of you who are unfamiliar, CANstruction is an international competition which challenges teams of architects, contractors and engineers in the building industry to design and build structures completely out of canned foods, following strict guidelines. The event benefits the Greater Chicago Food Depository collecting over 100,000 lbs of non-perishable items for soup kitchens, food pantries, shelters and programs throughout Cook County. OKW has participated in six previous Canstruction Chicago events, the most recent being 2013. In the past, OKW had always participated as an independent team. This year, we were lucky enough to team up with W.E. O’Neil and RTM Associates to complete our A/E/C trinity. With three separate firms competing as one, communication was critical. We got together for our kickoff meeting and realized that 99% of our ambitious team members had never participated in this event. What did we just get ourselves into?! Shortly after we voted and decided on building Dory, we heard from Canstruction that another team had also decided on Dory, asking if we could change our structure. Having already decided on cans, built a rendering, told sponsors what we were building, there was no turning back. Spoiler alert – the other Dory team ended up dropping out of the competition. Our greatest success was fundraising. We had an outstanding response to our marketing efforts by clients, coworkers, reps, family members and friends. We ended up raising $8,335! Confident in our funds, we created excel tables, calculated the number of cans we could afford, and headed into Mariano’s to place our order. Each can was carefully selected based on size, shape, contents and label color. So far, we were sailing through this whole Canstruction process - why did everyone say this was so much work? While doing her weekly grocery shopping, a team member noticed that our fundamental, blue label can for Dory – Roundy’s Fruit Cocktail – was sporting a new, beige label. No one had prepared us for an unexpected label change. Our orders were already placed, what could be done at this point? We had no idea what color cans would come in our order so we prepared for the worst. We calculated the least amount of blue cans that were essential to build a blue outer layer, while filling the center with beige cans. We each went to our local Mariano’s to clear their shelves of Roundy’s Fruit Cocktails. After about 15 different Mariano’s trips spanning three weeks, we collected roughly 480 blue Fruit Cocktail cans – just enough to cover our 7’ Dory. The time had come to pay/pickup our cans from Mariano’s. Our total dollar amount ended up being much less than we had thought – awesome! Extra discount from Mariano’s? Until we realized that we had only paid for and picked up 1/3 of our order. Where were the rest of our cans? We went back and forth with Mariano’s trying to track down our order – mind you, this was days before build night. There wasn’t time to order more cans, and we couldn’t possibly collect the number of cans we needed from shelf stock. Days passed between correspondence and we were all starting to lose hope. The terror of having to forfeit, the embarrassment of giving back our sponsorship money, all the wasted prep time. Mariano’s breezily mentioned another team had ordered from the same location as we did. Out of disparity, we contacted them. Is it possible they had accidentally picked up our 4,000 cans unknowingly? Within minutes we received a response that YES another team had indeed picked up our cans. After a brief moment of panic on whether they had their own cans, we confirmed that both team’s cans were safe and sound at the Mart. With a gigantic sigh of relief, we prepped for build night. We brought our matching t-shirts, rolls of tape, box cutters, snacks and headed over to the Mart. Build night was so much more fun than any of us could have anticipated. Finally, after months of late nights and preparation we would see our structure come to life. Building began at 6pm; by level 3 of 22 we were working at a pace of 13min/layer. The next 4.5 hours consisted of swiftly swapping out builders, directing Masonite placement, making sure each can is thoughtfully turned to the right angle, being mindful of structural integrity, maintaining organized chaos. By 10:30pm our Dory structure was complete! The structure was solid, and easily identifiable. Vibrant blues, blacks, greens and yellows, labels of nutritious food options that will feed Chicago households in need. CANstruction Chicago is the Food Depository’s largest one-day food drive that helps to put food on the table for the 1 in 6 men, women and children who turn to the Food Depository annually. In 2015, Canstruction Chicago collected over 113,000 lbs of non-perishable items. Although Canstruction 2016 is now over, there are so many ways to contribute to this cause year round. Together, we CAN make a difference. Please take the time to learn about the GCFD and the amazing work they do for our community. Finally, a sincere THANK YOU to those who supported our team and continued to encourage us throughout the competition. We truly could not have accomplished our goal without you.